This pectoral takes the form of a double-headed serpent. 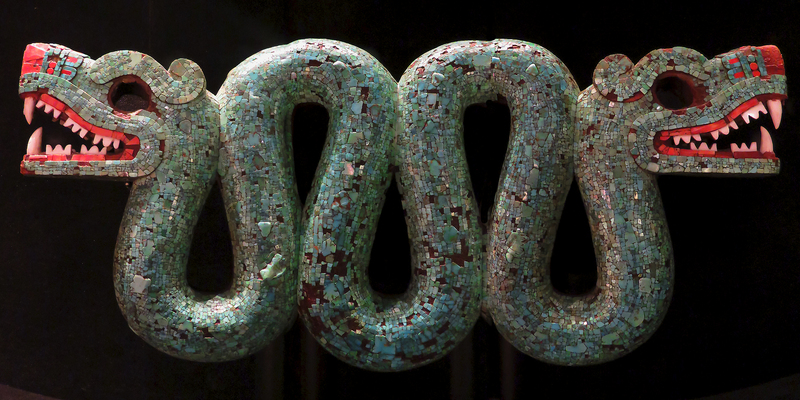 It is the signature artwork among the ten similar Aztec turquoise pieces at the British Museum. It is made of Spanish cedar and covered with a mosaic made of turquoise and red thorny oyster shell. The teeth in the two open mouths are made from conch shell. Two resins are used as adhesive: pine and bursera. In the mouths the resin is colored red with hematite. Beeswax adhesive survives around the eye sockets. It is possible that this sculpture may be one of the gifts given by Aztec emperor Montezuma, to Spanish conquistador Cortes when he invaded in 1519. Most of this description is taken almost verbatim from the British Museum website, which also offers the somewhat unusual feature of how the museum acquired the piece. According to this history, this piece was first offered to the museum by an Italian art dealer at the end of the 19th-century. The 350£ asking price was then judged too exorbitant. A couple of years later the owner died, leaving most of his estate to his spendthrift son and leaving his widow destitute. The museum then must have been able to picked up this piece at a substantial discount. This entry was posted in Art, History, Life, Photo, Photography and tagged British Museum, London by RegenAxe. Bookmark the permalink.